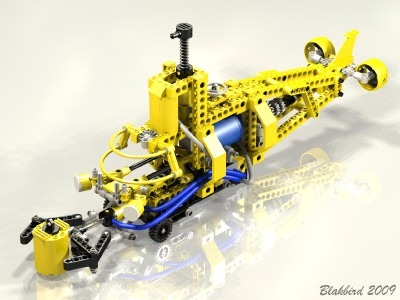 The 8250 Search Sub is the first and only submarine in the Technic line (if you don't count the alternate model of 8480). 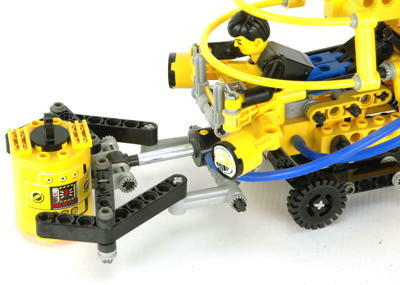 This is a large model for the Tech Play line, but still has simple features in line with the other models in the line. 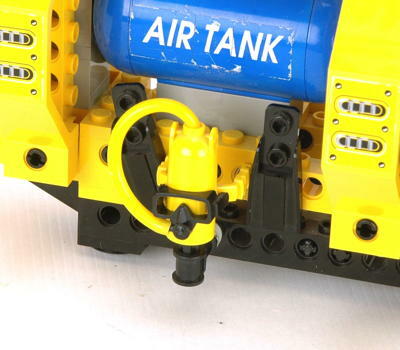 Pneumatics had generally been reserved for advanced models, but here they broke into Tech Play and even included the new air tank. The model also includes a pilot complete with a wetsuit and SCUBA gear. The model is quite well sculpted and looks more complicated than it is. For instance, all of the propellers spin only manually. This model was released under a separate number, 8299, and this second version included a CD-ROM with building instructions and a game (more information coming in future when I can get it to run). While the idea was novel and many kids had a computer in the house by this time, the passage of time has shown why this concept is a problem. While the model remains just as good and just and buildable as the day it was made, the software is nearly impossible to run on a modern machine and, even if you can manage it, is hopelessly dated. 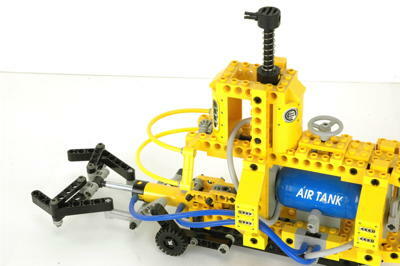 This model has a simple pneumatic system with only a single circuit, yet is very clever in its motion and uses the new air tank. The pump is hidden in the conning tower as a periscope. 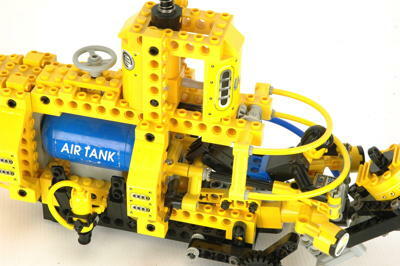 Air from the pump travels through the tank in series. If the switch is closed, about a dozen pumps will fill the tank with nearly 4 bar of pressure. Operation of the switch causes the front claw to open, close, and lift. The air tank is not strictly necessary since it is perfectly possible to simply pump on demand. 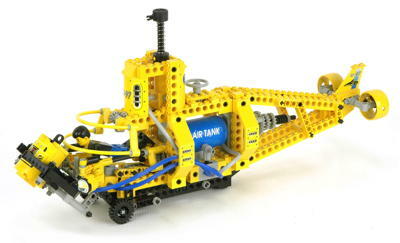 However, the tank will hold enough pressure for about 4 cycles of the claw and the initial cycles occur very rapidly. 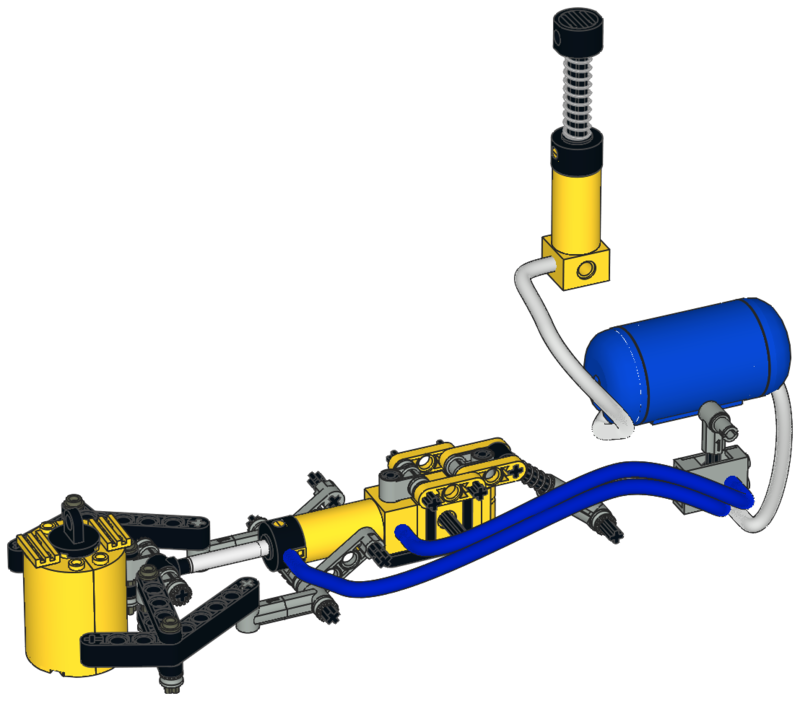 The pneumatic claw operates with a two stage motion. 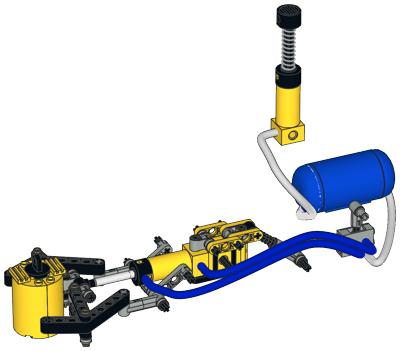 Initially, retraction of the actuator pulls on two links which closes the claw. When the claw stops against an obstacle, retraction can no longer close the jaws and therefore the motion goes to the second path. 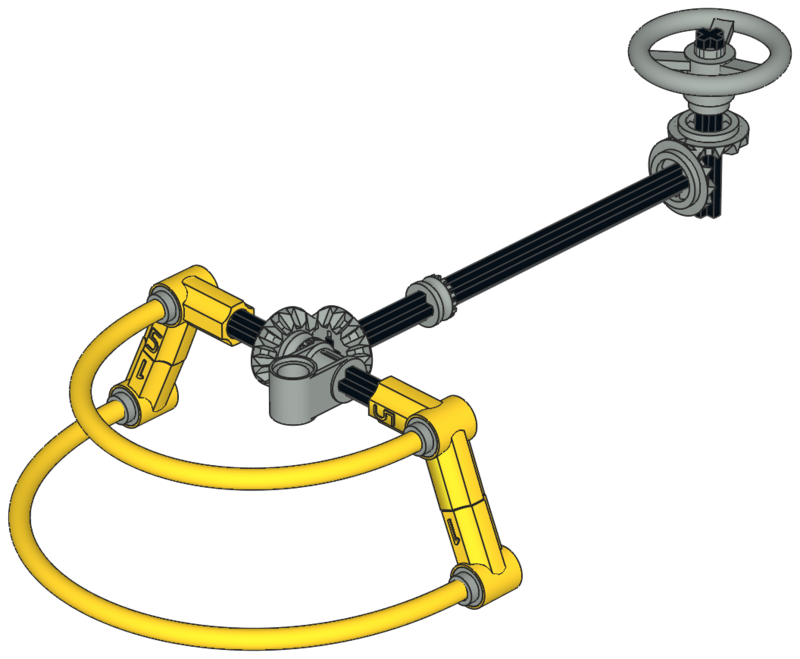 The entire actuator is mounted on a pivot so that retraction causes the actuator and claw to tip up. 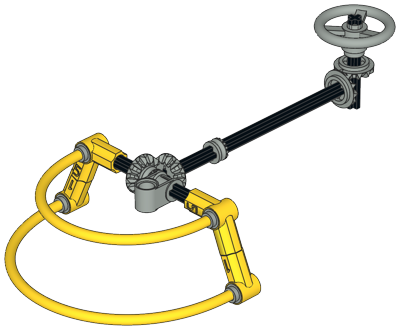 The back of the actuator pivot lever has a spring cartridge which provides resistance. Because the spring always has more resistance than the jaws of the claw, the claw always operates first before tilting. The animation shows it best. I don't know what is in the drum that the sub is collecting, but it must either be treasure or toxic waste. Or fish heads. Click for an animation of the claw in motion. The canopy of the sub can be opened 90° by turning the wheel on the top which operates through a simple 1:1 set of bevel gears. On the one hand, we can safely assume that the cabin is not pressurized as has no airlock because otherwise the canopy could not possibly open. On the other hand, the captain does not wear his breathing gear when inside. Click for an animation of the canopy in motion. The captain rides a mini self-propelled underwater exploration vehicle which is entirely contained inside the sub. 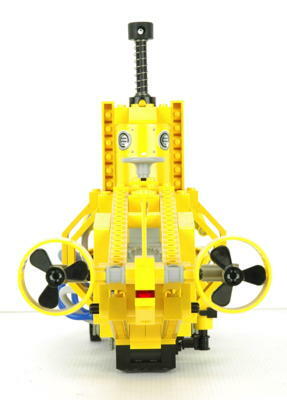 With the canopy open, he can swim out and explore the sea floor. The vehicle mounts to the sub with a couple of exposed axles. The drill seen on front is stored separately in the rear of the sub. 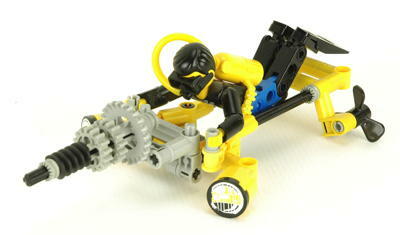 This vehicle has no functions other than the ability to manually spin the props and drill. 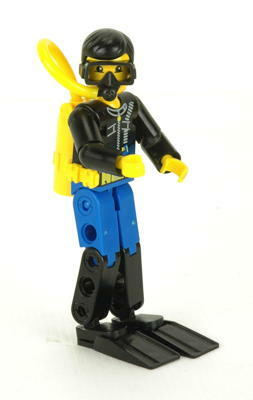 The set comes with an operator in a full wetsuit which is unique to this set. 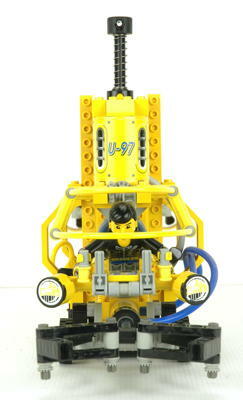 A set of flippers, a SCUBA tank, and a mask are stored on the side of the sub and can be clipped to the figure. Interestingly, the ears of the figure's head are used for attaching the mask and divots on his torso are used to attach the tank. The figures have apparently been provisioned for accessories all along, but this is the only set to ever use those features.